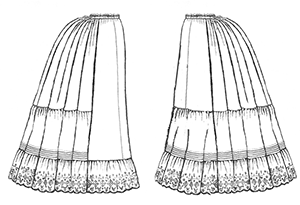 For my first official petticoat, I am using TV170 Victorian Petticoats, View 1. Tonight all I did was do pattern prep, which consisted of simply cutting out the pattern from the stiff paper that it is made because Truly Victorian provides hearty paper patterns in all of their styles. Tomorrow I will cut the fabric out and may or may not start sewing, we'll see. As a rule, I'd rather set goals that are easy to achieve and allow me to feel accomplished, and to possibly overachieve, than make ones that I can't possibly do and then I feel badly. It's better to take baby steps and feel good about the whole thing than to put myself into a failure place that makes me hate to even try. I also signed up for The Last Dinner on the Titanic through the GBACG, which is my local guild. It will be an evening of dinner and dancing in our 1914 finest clothes, and 7 out of 10 courses of the last meal on the Titanic will be served to us. It will also be held on the 100th anniversary of the sinking of the Titanic, so it's really amazing that they could make all of this happen. Of course, this means that I will have to create something to wear, which means that I should probably figure out what that something will be! I will get on that as soon as I finish this Polonaise outfit! Wish me luck!